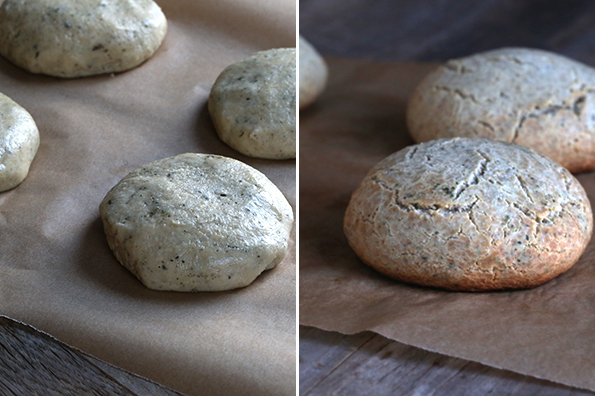 These Paleo rolls are crusty on the outside, chewy on the inside and have the taste of real bread. If it doesn’t have a real crust, for me it just doesn’t taste like bread. 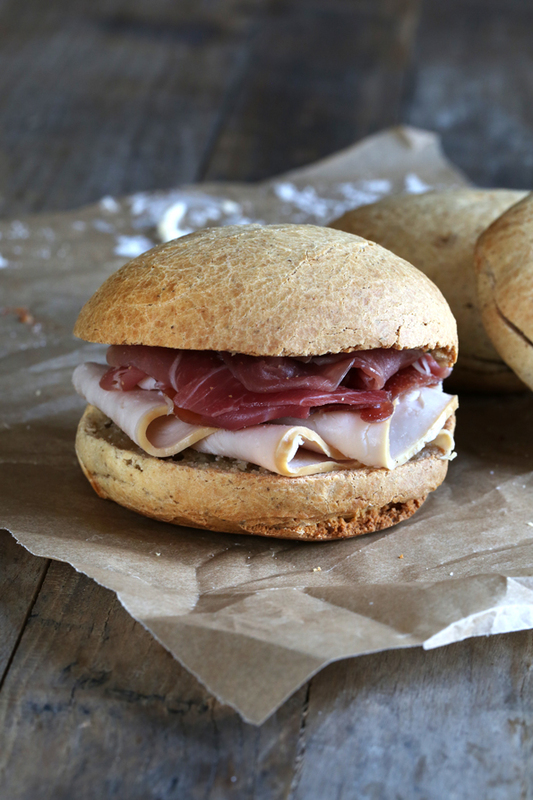 These Paleo rolls even make an excellent sandwich. It’s not an exaggeration to say that I have spent hundreds of dollars on ingredients leading up to this recipe. I don’t consider that money wasted. I fed it all to my family (sorry family!). My oldest can’t seem to get enough almond flour and almonds in any form every invented (score! ), so I hit that pretty hard with her. Anyway, recipe failures are a cost of doing business! I finally hit on exactly the right recipe—and decided that I could make it even better. I went on to ruin the recipe, instead, exactly 3 different ways. I won’t bore you with all the details. But I can say from personal experience that making substitutions in this recipe is not recommended! Even more importantly, I do not recommend modifying the method at all. At least not until you have made it precisely as written once. It works like this. If you try to handle the dough too much or try to add more starch to shape it that way instead of with wet hands, you will be burdened with tough rolls that are dense inside and can’t seem to bake all the way through no matter how charred they are on the outside. 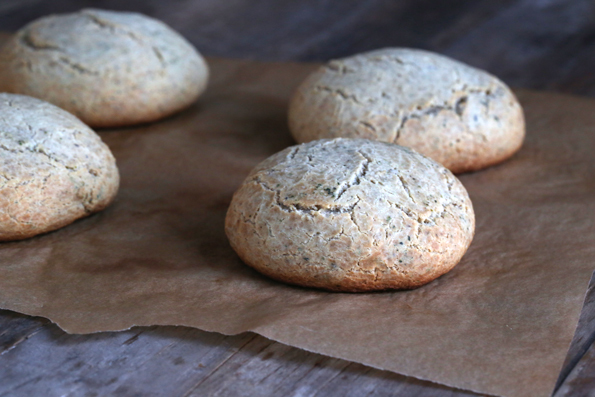 Looking for gluten free bread that isn’t Paleo but still doesn’t use rice flour? This Gluten and Rice Free Multigrain Bread recipe from Allergy Free Alaska looks very intriguing. Sometimes, you don’t need Paleo, just rice-free! I’ve taken some heat in the past when I make Paleo recipes as the ingredients tend to be expensive. But since I have such a deep reservoir of recipes here on the blog and in my cookbooks, I use the blog to experiment. As far as Paleo recipes go, though, this one is on the cheaper side. There isn’t a whole lot of almond flour in the recipe (just 1/2 cup total), and the starches are much less expensive. I do specify that not all tapioca starches are created equal, and if you try this recipe with tapioca starch from Bob’s Red Mill or your local Asian market, there is a good chance that the recipe won’t work and/or won’t taste very good. Those products are hit or miss, and more miss than hit. But the rewards are great here, if you’re willing to give these a go. And what’s more, once you have the ingredients, these rolls are ready in a flash. I love these so much that I make them just for myself sometimes. That’s something I really never do, as there are always cookbooks to be written and blog recipes to develop, not to mention children to be fed. But these are that good. Preheat your oven to 350°F. Line a rimmed baking sheet with unbleached parchment paper and set it aside. In a large bowl, place the tapioca starch/flour, coconut flour, chia flour, arrowroot starch/powder, almond flour, salt and (optional) dried herbs, and whisk to combine well. Set the bowl aside. In a small, heavy-bottom saucepan, heat the milk and shortening until the shortening is melted and the mixture is simmering. Create a well in the center of the dry ingredients, add the milk and shortening mixture, then the honey, and mix to combine. The mixture will the thick. Allow to cool briefly until no longer hot to the touch. Add the beaten eggs, and mix to combine. The mixture will be thick and soft. With wet hands and using a light touch, divide the dough into 4 to 6 equal pieces, shape each into a disk about 1-inch high, and place the rolls about 2 inches apart from one another on the prepared baking sheet. Do not add more flour to shape, and do not handle the dough too much or your rolls will be dense. Place in the center of the preheated oven and bake until the rolls are puffed, golden brown around the edges and very light brown on top (20 to 30 minutes, depending upon size). A toothpick inserted in the center of a roll should come out clean. Remove the rolls from the oven and allow to cool on the baking sheet for 10 minutes before slicing and serving. The rolls freeze very well and can be defrosted at room temperature or in the toaster, sliced. I recommend slicing the rolls in half before freezing if you intend to use them that way after defrosting. P.S. Don’t forget your copy of Gluten Free on a Shoestring Bakes Bread! I made these tonight. Measured on the scale, but the dough was more like batter. very loose. I couldn’t form in balls….so to not waste it I poured it onto the cookie sheet and spread it out. Baked and they were very flat. I have no idea what happened. I didn’t miss anything and measured by weight…..any ideas?! You haven’t given me much to go on, Stephanie, so I have to guess it’s the tapioca flour you used. They are far from all created equal. Other than that, my only other guess is temperature. The milk mixture sounds like it wasn’t cool enough. If that’s the case, it will firm as it cools. Good luck! Do you think substituting finely ground sunflower seeds for the almonds would be ok? I have an almond allergy. Thanks! Have I mentioned lately how much I love you?! I made these for dinner and managed to eat 3 myself. Oops. But nothing beats hot fresh bread straight out of the oven! They were wonderful – softer than I expected, strangely not dry even though it seemed it as I was mixing. Soooo very happy with this because it was fast and easy and yet tasty & GF too. Thanks for the good vibrations, Em!! Much appreciated. 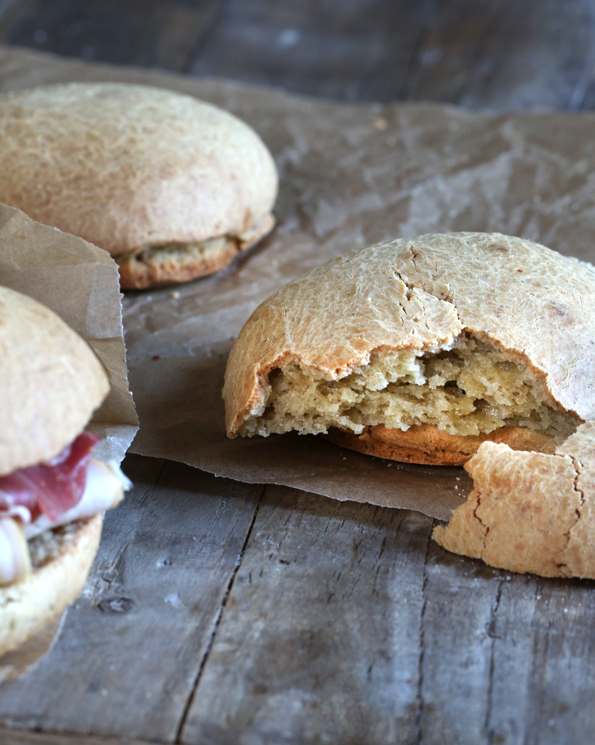 Thank you for what looks like an amazing, real paleo bun perfect for sandwiches!! Can’t wait to try it. Yeah me too… anyone know? I’m in New Zealand, and I used Kremelta with pretty good results. Would like to try other better fats some day, but for now at least we know that works. What method would you suggest for the mixing wet ingredients in? I kinda want to get in there with my hands…but thought maybe a strong silicone spatula or wooden spoon might be more appropriate. Guessing my mixer would be too much for this dough, huh? Geesh, I had to undue a lot of android updated stuff to get it so I could sign in and comment from phone (home with stomach bug). I cannot wait to try this one Nicole! So my hoagie rolls did not turn out. Have to figure out the fridge rise issue. I should have realized that I could not make quantity recipe calls for because did not get a great rise. Where do you put them for final rise? I normally turn oven on very low and stuff on stove top, but cooking calls for them to start in cold oven. Even final rise I doubled time and no luck. With your comment “Do not overproof” I did not want to go past that with final rise. So I got 8 crunchy outside, softer inside, yummy larger bread sticks instead of hoagie rolls to have with tonight’s dinner. I know because I had one already. So even though it looks like a fail, the taste/texture is a huge success! Going to get more proofing because I refuse to give up on them! Okay. I was afraid of overpoof per comment in recipe. I will let it stay however long it needs to for final rise. My mistake. It’s 4 fl. oz. (that’s correct), which is, indeed, 1/2 cup. I am always backing in to that sort of volume measurement, so it’s easy to make a mistake no matter how many times I check it. Sorry about that! Am I missing yeast or another leavening agent? If you’re asking if there is something I neglected to add to the recipe, the answer is no, Anne. Everything is in there. I checked 3 times! What creates the rise? Or do the eggs have to be beaten into a foam? Anne, I didn’t exclude any steps. You don’t need to beat the eggs into a foam. Ok – this is a fantastic looking roll! Thanks for the recipe!! I really love having bun options, I do! It sounds weird I know. In your comments did you mean to say: “Try NOT to handle the dough too much, OR try to add more starch to shape it that way instead of with wet hands…” I see the instructions say wet hands so I will do that for sure. I get the difference between Honeyville and other almond flours–I’m quite partial to Honeyville myself, but I am very curious about your comments about tapioca flours not being equal. What has your experience been with that? And those buns look fantastic, by the way! I will admit that I had never believed her about that. (Sorry, Nicole!) I have always purchased Bob’s Red Mill. And using a small amount of it in a recipe that had a high percentage of other flours, I haven’t tasted any difference. However, then I made the Brownie Brittle with it. And I totally understood. It tasted very metallic-y. As in, my husband and I couldn’t eat it it was so nasty. Given the high amount of it in this recipe, I would trust her. ;) I’m like a child, though – have to make my own mistakes. Once I use up my seemingly never-ending supply of Bob’s, I’m switching to Authentic Foods permanently. so, no substitutions? I dislike chia…..do you think flax would work? I’d give it a go with the chia, Pam. Perhaps you won’t be able to taste it much. I find sometimes that I don’t like the texture of chia (I want to like chia pudding – I do, but ugh), but does it have much of a flavor? Maybe it will hide itself. ;) I hide it in my smoothies every morning. I agree – that Chia pudding is not right in so many ways…. Lisa, as I explain in the post, I cannot recommend any substitutions in this recipe. If your son doesn’t have to eat Paleo, I would recommend trying one of my conventional bread recipes. I can’t wait to try out this recipe, thank you! I know that it’s best not to modify your recipe, and I’d love to make it as such but I don’t know what vegetable shortening is? Here in France, I’m not sure what I could replace it with…any ideas? Celine, in my experience, any fat should work in place of vegetable shortening. I usually use coconut oil or ghee in my baked goods. That is not always true, Chris, as virgin coconut oil has significantly more moisture than vegetable shortening. I haven’t tried it in this recipe as it is written (I tried it in other iterations, and did not like it), but as always feel free to experiment! Some paleo recipes are ok with grass fed butter, would that be a better sub? Conventional vegetable shortening is hydrogenated fat, usually sold as Crisco. It is extremely unhealthy. Nonhydrogenated vegetable shortening, made by Spectrum Naturals, is solidifed palm oil, but not through hydrogenation. You can find more information on it online, I’m sure. Isn’t palm oil tremendously bad for the environment? But yes, Palm oil isn’t recommended because of that. If it helps any, I used a coconut oil based product (I’m in a different country and the recommended stuff isn’t available here) and I had great success.